When you are an expectant mother, one of the most exciting things to do is decorate your baby’s room. When you pick out the crib, most moms want to have a mobile hanging above it for baby to look at while they are laying down. This is one component of your baby’s room that is easy to DIY, which can save you money as well as personalize the room just the way you want it! There are so many options for DIY mobiles that it is possible for anyone—even the most inexperienced creator—to make a beautiful mobile to entice your new baby. Many parents choose to go with a theme for their nursery. Some of the more popular themes include things such as jungle creatures, zoo animals, Disney characters and princesses. Don’t be swayed by the popular themes. A nursery can have any theme you choose and it should be specific to what you like! A mobile is one of the things that can fit in with the theme you choose, along with stickers and other small decor items. If you don’t choose a theme for your nursery, you may come up with a certain color scheme that you want to incorporate. 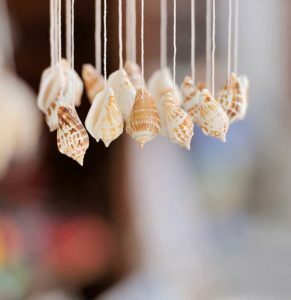 A DIY mobile can also be tailored to fit in with the colors you go with. A mobile can be made out of so many things. There are unlimited options for how you make one for your nursery. The first thing you should decide on is a “skeleton” for the mobile to hold it together and hang the items from. Plenty of options exist everywhere from Walmart to Home Depot. These are only a few of the options for the start of a mobile. Be as creative as you can and see what you can come up with! After you figure out how to base your mobile comes the fun part: Decoration! This is where you can really be creative and turn it into something special just for your baby. The best thing about a DIY mobile for your baby’s nursery is that you can’t mess up! Your little one is going to love looking at whatever you make. It doesn’t have to be fancy. If you can sew, break out the sewing machine and throw together some felt shapes that match your theme. Remember, colors and lights are what capture baby’s attention more than anything. Think outside the box! Making a DIY mobile can be a special way to prepare for the arrival of your baby. It is a way to personalize the nursery and begin to imagine your baby sleeping it in. There are endless options for what type and style of mobile you can make which really leaves the project open for creativity. Baby mobiles are a great way to stimulate baby’s developing brain, and one that you make for them will be a keepsake that you will treasure forever!